Real tennis is the original indoor racquet sport from which the modern game of lawn tennis is descended. It is also known as jeu de paume in France, “court tennis” in the United States, “Royal Tennis” in Australia. It is still played by enthusiasts on 47 existing courts in the United Kingdom, Australia, the United States, and France. 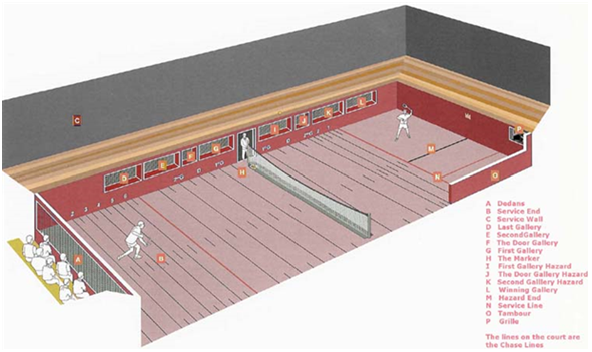 A real tennis court is enclosed by walls on all four sides, three of which have sloping roofs, known as “penthouses”, beneath which are various openings (“galleries”) from which spectators can watch the game. There is also a buttress (tambour) which intrudes into the playing area off which shots may be played. Points are won or lost when errors are made (e.g. by hitting the ball into the net or out of the court). They may also be won by striking the ball into the winning openings (i.e. the dedans, grille or winning gallery) or so that it bounces on the floor for the second time between the service line and the end wall at the hazard end. If a ball bounces twice anywhere else on the court or enters any other gallery before a player touches it, a chase is set (said to be laid). After changing ends, the chase or chases are played off in the order in which they were laid. When chases are played off, the receiving player (or server in the case of a hazard chase) must hit his/her shots so that their second bounce is closer to the back wall than the chase being played. For example if the chase is 6-yards, he/she must play to 5,4,3,2 or 1 yard on the second bounce in order to win the chase and the point. If the ball falls short of 6 yards on the second bounce the chase is said to be lost and the server wins the point. The terms one and two, two and three etc. denote that the ball has landed on its second bounce equi-distant between the two chase lines. The terms ‘better than’ and ‘worse than’ are used to give more precision to marking chases (e.g. ‘better than 4 yards’ denotes that the ball has landed on its second bounce nearer to the dedans back wall than the 4 yard line. ‘Worse than 5 yards’ denotes that the ball has landed on its second bounce further up the court than the five yard line).